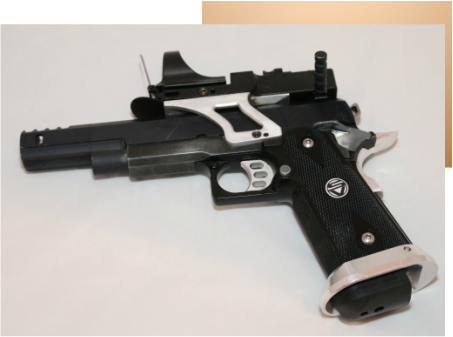 We get a lot of questions from our videos about the guns we run so we wanted to start off by highlighting one of our team member’s pistol because you often see him taking out a crowd of players with a ridiculously quick trigger finger…and he’s only using a pistol. 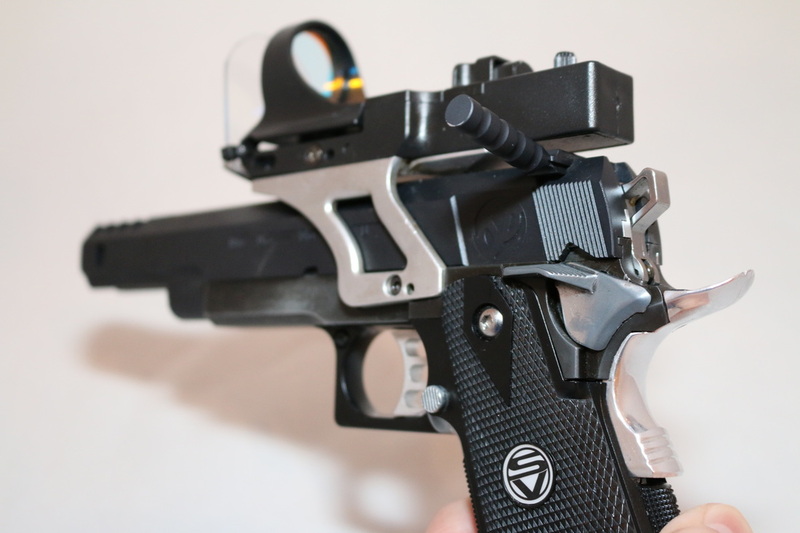 Christian’s Tokyo Marui Hi-Capa pistol is set-up in a fashion that you are more apt to be see in an IPSC shooting competition than in an arena scrimmage but rest assured this pistol has been made to be deadly accurate and consistent. 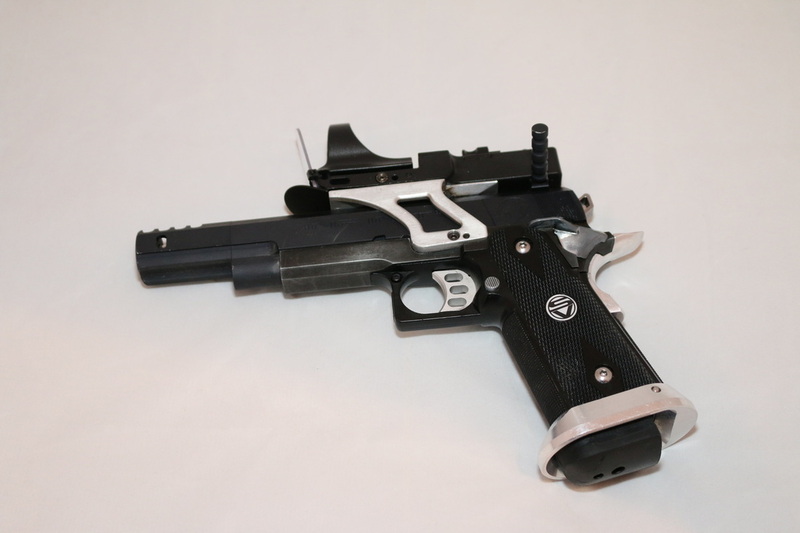 While a lot has gone into this weapon to make it what it is today, it doesn’t sit on the shelf and held only with white cotton gloves, this pistol takes as much punishment as it dishes out and keeps going and going and going. Add a few aesthetic upgrades and a protective shield in front of the sight since unlike IPSC competitions BBs are coming back at us and you have a lot of pistol. Here in the Northwest the weather and temperatures don’t always cooperate with green gas so he’s currently running a “winter set-up” which consists of running the pistol off an HPA rig instead of green gas. Mags are tapped and a Redline Firebase Air System and Guerilla Air Myth 62/3000 HP System Aluminum Tank provide the juice. For those of you that aren’t familiar with HPA set-ups, you’ll see them in airsoft used with Polarstar rigs and unlike green gas which expands and can freeze a pistol up, HPA remains consistent but you are running a hose to your mags which will slow you down. 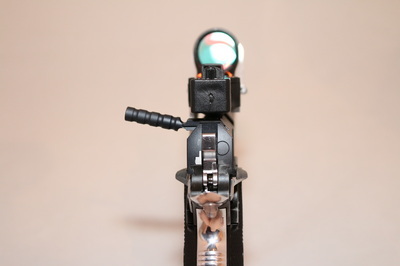 Trust me when I say with practice, mag changes come quick and we do them all the time during a scrimmage. 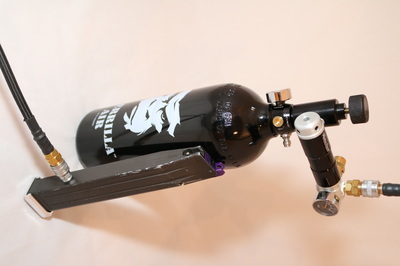 With five different team members having some sort of HPA set-up the load-out wouldn’t be complete without a way to fill our tanks and while high pressure air is only as far away as your nearest paintball shop we opted to get a scuba tank with a Ninja Paintball Scuba Yoke. 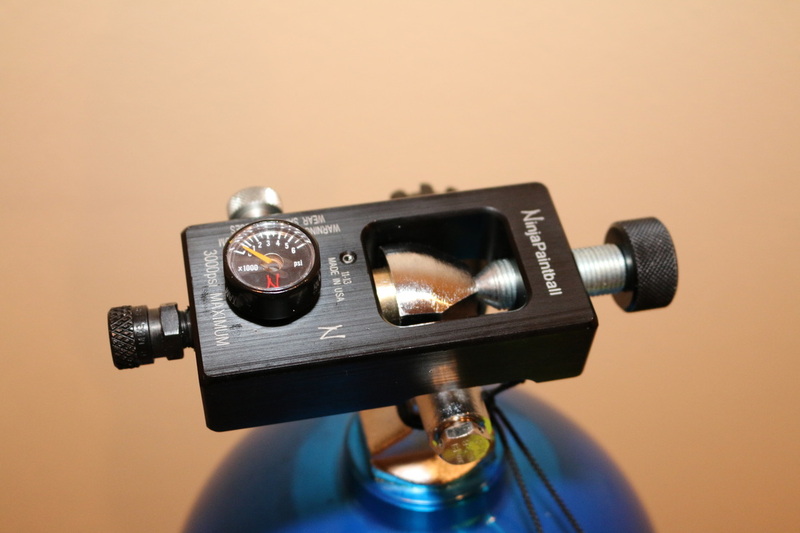 This allows us to conveniently fill our tanks which easily last most of the day as our pistols only require ~85 PSI to run them at 330FPS with .20 BBs. Don’t forget to follow us on our Facebook page and subscribe to our Youtube channel. We’ll be getting more weapon profiles out soon and videos as well!